The TAG Travel Pitchers Screen 7 x 7 with cutout and heavy duty carrying bag. Sets up in less than 2 minutes. 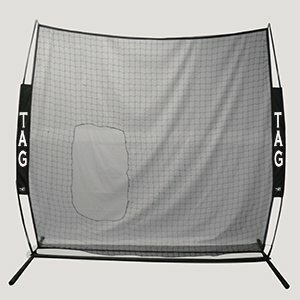 Portable and provides 7 feet of protection for pitchers. Added flexibility upon impact, provides more stability and balance. Rubber feet prevent damage to gym floors and provide traction and stability. Polypropylene, 3mm knotless net, 1 7/8" square mesh. 32mm x 1.2mm all steel tubing. 12mm OD fiberglass poles. Great for baseball, softball, football, or other sports!